I was raised in Abuja, Nigeria. Being the second child of my family and the only girl, I grew up learning to comply with expectations set for me by my parents and society. Good morals, obedience, and hard work were qualities I possessed. By the time I was eight, I developed the hardworking nature required of me. I could fetch water, clean, attend religious activities and study, too. I grew up in a turbulent environment and learned to value the importance of peaceful living. Hence, I passionately developed good values, such as tolerance, and avoided being involved in disputes. I endured stress and focused on working harder in my academics. I was able to do this because of the love I had for my parents and the desire to make them happy. Before I reached the age of 12, I had started receiving good reports and recommendations from my teachers. I became the smiling one everyone wanted to be with. I also loved reading and traveling. Many people recall always seeing me with a book — even at a party. I had to cope with my parents’ financial situation, including when I was sent out of school due to not paying fees. I would always look for a way to go and speak to the school authorities to plead with them. Even if my requests were not granted, I would linger around until I was allowed back into the school. This made me develop the persistent and determined nature I have today. Applying to Ashesi was a scary thing for me. I looked forward to Ashesi’s admissions offer based on prayers and a miracle from God. When I received the admission package, I cried because I didn’t believe that the scholarship was real. I was in doubt until I received a call from Ashesi’s admissions committee. Then I told my mum, and we were very excited. It was a great joy because I would be the first amongst my siblings to go to university — and as a scholar. I was going to the Harvard of Africa. I was overjoyed. My joy followed me to campus. From the first day I arrived at Ashesi, I have never had any regrets at all. The most amazing thing to me about Ashesi is the number of friends I’ve made and the support I receive daily from the faculty, staff, and students, and even the chefs and security officials. They are amazing and supportive! 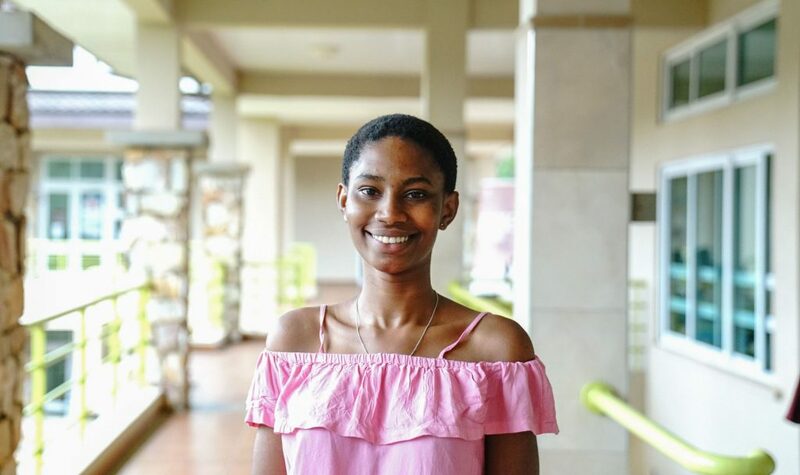 I have been able to become close friends with some people, receive encouraging words from faculty members and the help of all kinds from Ashesi students. This is the right environment in which I know that I can fully harness my God-given potentials and become great in life by impacting the lives of others just as I have been impacted upon. I also joined several groups that are focused on developing technological applications that would ensure adequate provision of services to human beings. Such groups allow me to connect to my future aspirations. Four years from now, I hope to build a strong career in technology using my degree in Computer Science. I intend to use the skills and knowledge developed from my Ashesi experience to create a positive impact on society. My major aim will be to impact lives positively in whatever possible way I can and to uphold the value of ethics and morals within African society. I am very grateful for my academic scholarship, most especially to be a Jim Ovia Scholar. Being a part of the first cohort means that I have a major commitment to excellence in my Ashesi experience. By attaining excellence, I will be able to make my donors proud. I must also say a big thank you to the Jim Ovia Foundation Leaders Scholarship (JOFLS) team for believing in me and providing all the necessary support for my success and development at Ashesi. In fact, I feel like a celebrity here on campus due to my scholarship. My stipend also gives me a great feeling too. As an appreciation to the JOFLS team, I promise to make the best out of my stay at Ashesi and make your investment in me profitable and worthwhile.